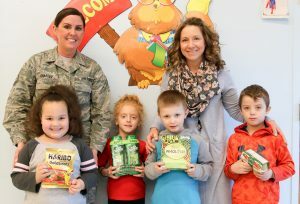 PHOENIX – A lesson in selflessness and giving was in focus at Michael A. Maroun Elementary, as first graders recently donated to the Treats for Troops effort. 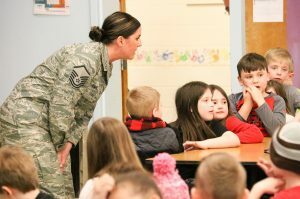 PCSD’s Director of Curriculum Stacie Shaffer, who served in the Middle East as a member of the US Air Force, thanks first-graders for collecting Treats for Troops. Teachers, students and community members banded together to collect items for soldiers deployed overseas. They brought in personal hygiene items, granola bars, candy, snacks, games and other goods that were boxed up and shipped to troops for an anticipated Easter delivery. First grade teacher Carrie Spoto and some of her students showcase the items they collected for troops, as PCSD’s Director of Curriculum Stacie Shaffer thanks them for their contributions. Sharing in that gratitude was PCSD’s Director of Curriculum Stacie Shaffer, who served in the Middle East as a member of the US Air Force. Shaffer thanked the students for their donations and told them that their actions will have a significant impact on the recipients.